vulnerable package in it was more than either of us had prepared ourselves for. I remember driving at a very slow speed with our flashers on. 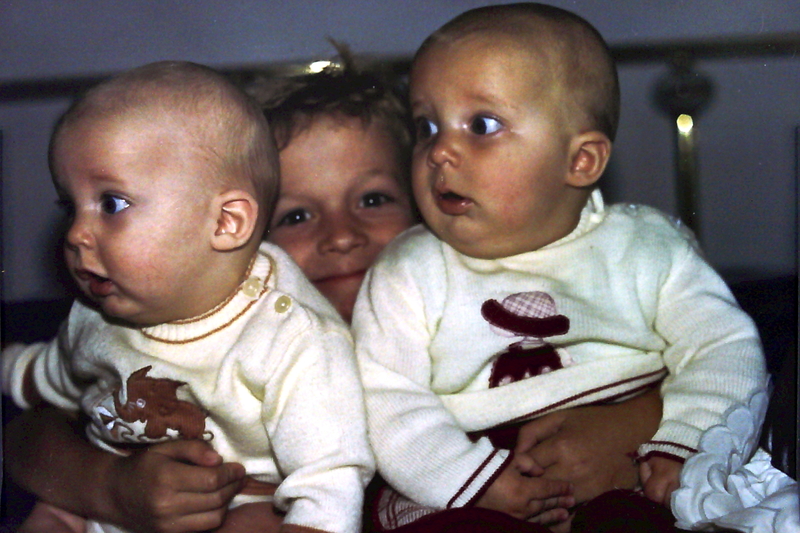 Three years later our first set of twins were tied in beside their older brother who took his job very seriously. He sat between them in the car on the way home, and poked them now and then to ensure that they were still alive. older brother than TV. He was fascinated with every moving part of them. were very pleased to find that the new borns had brought them gifts. I suppose it seemed logical, noting mom’s girth-before-birth, that there would also be presents in there along with the babes. The children peered into each little tightly wrapped bundle to have a good look at the two wee boys we’d named Stanley and Eddie. Unlike many, I loved being in the hospital. What’s not to like? after the babies when you’re tired! Though I’d politely asked if I could stay a week, I was given the door after just a couple of days. Greg arrived looking even more shredded, but once we left the hospital doors, he’d perked up considerably and was actually humming as he plunked us all down in the car and whisked us home at a pace far, far different from the one set a mere five years ago. I peaked into the blanket to double check. “Eddie” I said. “Nope. That’s his,” she said pointing to her twin brother. Apparently the claims had already been struck. and lifted a little lip. A set of pink of gums grinned back at me. “Oh, babies don’t have teeth” I explained. “What! No teef!” With a look of dismay, she ran off to advise her brother of the missing body part. The two of them returned moments later. It’s a wonder kids survive their childhood. In five years you might say that our cautious behavior abated somewhat. I have a mathematical theory for this, which does not stand up well to scrutiny. However I developed it to keep a measure of sanity in my life. person can have. If you have one child, you can really smother them in it. If you have five or six, then you have to spread that a little thinner, so that they all get a bit. One interesting side effect this thinly doled caution had was that our eldest son began to fill in when my concern seemed a wee bit lacking. For example, he might become a bit frazzled when set number two would have “car” races with set number one. The cars consisted of the bucket seats that we transported the babies in. Set number two would lap the house, lurching precariously around corners. The faster they went, the more the babies giggled. Of course there is only so much stress a seven year old can harbor, and after a time he would give up, and just join in the fray..
A couple of years later, contrary to dire warnings from our doctor that there was something like a 75% chance that I would have multiples again, we decided that our lone daughter needed female companionship. I figured that I had a singleton once, so I could do it again. After all, when you’re wet, what’s another raindrop? When we announced that number six was on the way, we got a variety of reactions. The youngest set of twins just nodded as if to say, “Sure, sign ‘em up”. The eldest set laughed. Great – more chaos! Our number one son slapped his forehead and groaned. Unfortunately, that factory only manufactures by the half dozen. It’s now closed for renovation.